Download Rainbow Loom Video Guides free via AppsHawk. 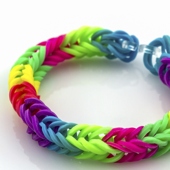 Over 150 of the best Rainbow Loom instructional videos! Lots of people are enjoying making craft items made with Rainbow Loom. This fun app will show you videos on making bracelets and other awesome designs using a Rainbow Loom! This app requires an internet connection to function. The end user is responsible for providing internet connectivity. Disclaimer: This app is for educational purposes only. The author of this app does not claim copyright to any material available via YouTube. No copyright infringement is intended. Please use the Support URL listed for this app to contact the author with copyright inquiries.